US National Archives photo # 80-G-1014615, a US Navy Photograph, now in the collections of the National Archives. Canopus (AS-9) was launched in 1919 by New York Shipbuilding Co., Camden, N.J., as Santa Leonora; acquired by the Navy from the Shipping Board 22 November 1921; converted to a submarine tender; commissioned at Boston 24 January 1922, Commander A. S. Wadsworth in command; and reported to Submarine Force, Atlantic Fleet. Canopus remained at Boston until 9 November 1922, when she sailed for further fitting out at Coco Solo, C.Z., and San Pedro, Calif., her base as tender to the submarines of Division 9 until 17 July 1923. Sailing to Pearl Harbor, Canopus tended Submarine Division 17 of the Battle Force with whom she sailed for permanent duty with Asiatic Fleet in September 1924. Arriving in the Philippines 4 November 1924, Canopus began her regular schedule of services in Manila Bay, and each summer based with the fleet at Tsingtao, China, with occasional training cruises to various Chinese and Japanese ports, and to the British and French colonies. Between 1927 and 1931, the tender was flagship of submarine divisions, Asiatic Fleet, and later was attached to Submarine Division 10 and was flagship of Submarine Squadron 5. On 7 December 1941, Canopus, aging but able, lay at Cavite Navy Yard, as tender to Submarine Squadron 20. In the anxious days that followed, her men worked day and night to repair ships damaged in the daily air raids as well as to keep her brood of submarines at sea. With the Army falling back on Manila, Canopus sailed to Mariveles Bay at the tip of Bataan on Christmas Day. On 29 December 1941 and 1 January 1942, she received direct bomb hits which resulted in substantial damage to the ship and injuries to 13 of her men. Working at fevered pace, her men continued to care for other ships while keeping their own afloat and in operation. To prevent further Japanese attack, smoke pots were placed around the ship and the appearance of an abandoned hulk was presented by day, while the ship hummed with activity by night. 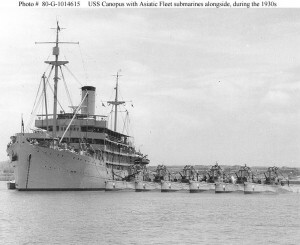 Just before the New Year, the last of the submarines left Canopus, but her activity continued as she cared for small craft and equipment of the Army and Navy, sent her men into battle in the improvised naval battalion which fought so gallantly on Bataan, and converted her own launches into miniature gunboats which attacked the Japanese moving south near the shore. But the overwhelming Japanese strength could not be held off forever, and upon the surrender of Bataan on 9 April, Canopus was ordered scuttled and sunk, to deny her use to the enemy. On 10 April, she was proudly backed off into deep water under her own power, and the brave veteran whom the Japanese could not sink ended a lifetime of service to the Navy when she was laid to rest by her own men. Canopus received one battle star for service in World War II. 2. The enclosed diary covering the period from 8 December 1941 to 9 April 1942 was accordingly made up from memoranda and notes retained by the former Commanding Officer of the USS CANOPUS, and is forwarded herewith for use by the Office of Naval Records. A summarized report of the war operations of the CANOPUS was previously submitted. NOTE: All references to time used in this Diary are local time (Zone minus nine) except prior to 16 December (Zone minus eight).